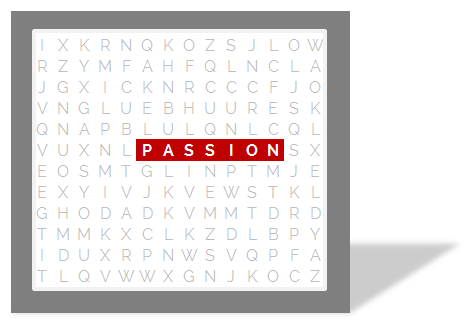 How do you know Excel is your passion? Or is it? I am searching for my passion, you know that thing that makes my heart sing. I mean I am listening for the pitter-patter in my ticker. So how do I know if Excel is it? Or anything for that matter. I am looking for that thing that will make me turn my tv off. (TV is my crack, I am truly addicted). I thought it was database development and honestly I am not altogether sure that it isn’t. Excel may be a substitute. A more attainable passion. Give me some insight peeps. Some thoughts, musings, ideas. As usual, many of our forum members chipped in with words of wisdom. Hopefully Cheryl saw their replies, if she ever managed to turn off that tv. That gave me an idea for this week’s poll. Passion is an important force in our life. It is what makes us do mad, unreasonable, impossible & life-altering things. So, lets take a minute and examine what are we, as a community at Chandoo.org are passionate about. Of course, I do not feel the same intensity of this passion everyday. Some days I learn a lot more than I can understand or remember. Some days, I just do not learn (or share) anything at all. But learning & sharing is what drives me every day. Apart from this, I am also passionate about technology, traveling, legos, photography, books, design (of charts, dashboards & information displays), writing, walking, humor and living a simple & sustainable life. Go ahead and tell us what you are passionate about? How do you fulfill this passion? If your passion relates to data analysis, visualization, automation or reporting, in what way Chandoo.org can help you? I am passionate about Automation may be because i'm lazy 😛 But when it comes to learning something new i'm not at all lazy.. I want to learn a lot about programming which helps in automation..Looking forward to learn about APIs now.. I am passionate regarding being able to do a task more efficiently and faster. Using tips from Chandoo has given me knowledge to be able to accomplish these tasks. There is always more to learn and it has awakened a desire to become a champion of excel. The thirst for more knowledge has now turned from just Excel to VBA, SQL and more. Thanks for posting so much useful information and assistance for all of us. I look forward to more visits to your site. I work for a global nonprofit--Oxfam America--with the mission of ending poverty & injustice and it is fighting injustice that stirs my passion and engages my energy. Individuals & foundations give us the resources to pursue that mission and part of my role is to ensure appropriate utilization of those resources. Excel is a tool that helps facilitate accountability, identify potential issues and improve operational efficiency so it is a huge asset to me in my duties. Additionally, the improved pivot tables & slicers make it easy for me to build tools for monitoring and reviewing financial data that non-finance people can easily grasp and use, making it much easier for me to include others in the review of financial data. From a work standpoint, I am passionate about Microsoft Office Custom Ribbons. I show these to everyone I work with and give examples how it can improve their work experience. I have multiple ribbons that I share with others using Excel and Outlook. These can be useful in Word also, but I don't use Word near as much as Outlook and Excel. I am obsessed about learning & sharing it with others. I got almost revolutionary kind of zeal to ensure everybody around me knows as much as I know & I know as much as everybody around me. I got this uncontrollable urge to know “how” things work and is keen on developing sustainable, simple solutions for complex problems. I like to see everything in this word from a framework of science & problem solving. My goal is to focus this passion to be more practical for a sustainable & content life( too utopian as of now :D). I am passionate about learning everything I can learn about Excel to make me more efficient on the job. When I see something new, I imagine how I can incorporate it. Currently, I am passionate about learning PowerPivot (2010) and discovering how I can use it in higher education (non-financial data) and sharing that knowledge as limited as it may be right now. My problem is finding and devoting the time!!!! They could be much better, but I'm just getting started. I'm passionate about data and the power that information gives you. I have to agree with points made by Ranjith and Karen. I enjoy working in Excel, creating some semblance of order from the chaotic mess which is my source data. And, although I do derive satisfaction from such endeavors, I'm too lazy to continually perform the same tasks over and over manually, so I got into VBA. In fact, I think I enjoy constructing, deconstructing, and modifying macros more than I do working with the data. But as I learn more and more about VBA, it has caused me to explore similar applications such as Access and SQL (I currently use Crystal Reports to pull a lot of my data, but I'm learning how to put together similar queries in Access then code them using VBA). I am extremely passionate about teaching, and especially when it comes to my adult college students who take my Excel or MS Office applications courses. My classes consist of adult learners coming back to school to take courses in MS Office such as Excel, and primarily for improving their job marketability, or increasing their current job performance. With each Excel course I teach, this passion for teaching comes through as students are taken through courses from basic to advance with a twist of humor and excitement towards new learning. Then there is the exceptional "tips and tricks" I can use in my classes, and share thanks to Chandoo and all those who contribute. I share this site with all my Excel students and suggest they take advantage of the informationa and courses to become even better "Ex cel sperts"! Im just reading your reply to this thread. Im the Cheryl with the original post. Nope, I still havent located my passion. That may be it, my passion is locating my passion???!! Anyhoo, I too would like to teach Excel to adult students. Ive had the opportunity to volunteer teach on the job, but Im having a tough time breaking into the college scene. Ive applied to three local community colleges and one online college(not at all adverse to online teaching). You have any tips on how I could break into the area? Congrats on discovering your passion. Later on, I started working with my boss on late nights, that's when he started nagging and scolding me ..that I wasn't good enough in excel. All the negativity built up slowly little by little, and when I quit my job , I went on to Saudi Arabia, that's where I got time to practice Excel ...as snooker is not a populat sport there. At the same time, I found Chandoo.org ...Excel became my passion...and I haven't stopped, I thought now that I am good enough lets start teaching....and this too paid off...but Excel is like the pacific ocean, you can never get a hold of it...there is something new everyday and so many experts out there...this is what keeps me going, trying to learn something new in excel everyday......A very big thanks goes out to Chandoo....a true inspiration ...and a good example to others...at the moment im addicted to learning VBA...hope I can pass on the knowledge to my 4 kids someday and make them Excel Experts!!! My passion is building. Every Saturday, I spend the day building houses with Habitat for Humanity. We have a dozen different 'standard' models of single family homes. Each is different. The take-off or cut lists for framing each house are unique to the houses. Why would I post such a thing to an Excel forum, you ask? (go ahead... ask)... I developed an Excel workbook that asks for a single input (the model of the house) and it outputs a cut list of all of the framing members. OK... maybe I have a bit of a passion writing Excel based apps too. I just recently saw a blog that said it is curiosity that fuels your passion. That makes sense to me. I am very curious and I love to find the ways to solve problems and create reports for people who are too busy doing their work to figure those things out. My passions are entertaining people, sharing knowledge, problem-solving and learning. Those consistently show up whether the topic is Excel, playing bass, food or anything else. I also really like getting my Excel projects to work!! It's exciting! My biggest work passion is creating more presentable and professional looking sales reports utilizing skills that I have learned here on Chandoo. What used to be a un-organized mess, has become a very simple report for my direct Supervisor and upper Management to read. Chess. Crack is less addictive. As HG Wells said, "You have an aspiring artist, a rising politician, you wish to destroy? Poison, dagger and bomb are clumsy and archaic. But teach him, inoculate him, with chess." Nothing is like Excel to me. Now I am passionate on how to make interactive worksheets. I'm passionate on learning and sharing my knowledge. And I'm using Excel as one of my tools. That's why I started the website ExcelXL.nl. I'm not really passionate about anything but I do think I have a duty to make the most of myself, to not follow convention, if that is the most suitable course, and to do my best to make my contact with others something that makes their time on earth better rather than worse. Excel can fit in nicely with the above. Really passionate and learn any new things to improve skills and also share the learnings. at chandoo i learn a lot about excel and its features which helps me in my profession. your passion to share the learnings are appreciatable. I was quite eager to learn Excel. Since I visited CHANDOO.ORG, my eagerness converted to CRAZE & then PASSION. Other friends of my group turn to computer games as soon as they get a little time , I turn to Chandoo.org / exceltips.com & learn something new to learn excel. I'm passionate about farming and ecological food productions; that's why I live on a farm. But I'm also passionate about technology, work-efficiency, running, flying, music, tools, car mechanics, wood working...wow, I can keep going! I'm passionate about design, such as masterplan, graphic, method, documentary, and anything, i love to push all potential creativity that i have. In my work i can do my passion in designing dashboard, quality control method, and my department KPI. Of course i'd need a bunch of reference, and chandoo give me a lot. Please post more about fancy chart. Working on the things I love to do...one of them happens to be excel. Thanks to forums and sites like Chandoo, Mr Excel, Datapig... I very much enjoy automation using excel.. Saving myself and my coworkers from hours/days of mind-numbing, repetitive, error-riddled, copy/paste, fill-down and across, procedures that result in workbooks no one understands but are very colorful. Any tip I can pick up from Chandoo makes me superstar at work. Reading this post I thought: "pff passion aint no thang... I got this." Then I struggled to begin my reply. I love my job as a Production Truck Designer but that's not my passion. Not by a long shot. I realised my passion begins with my obsession of funny kitten posters and ends with my love for molding young minds. At our company, we invite anyone from the community to participate in our productions. We have volunteers as young as 15 and others as young as 75. I started designing our trucks with these people in mind and kept the trucks simple so they can be learnt easily. Since I’ve adopted this mentality, we’ve seen an increase in enrolment in the volunteer program. This then turned into monthly newsletter with all sorts of information on live productions. Then completely unexpected to me was that writing these information emails to volunteers caused me to learn more than I ever have in my career. So all this to say, my passion is understanding information so I may use it to teach people… and funny kitten posters. I’ll also throw in some funny cat videos in there. Makes me seem more cultured. In fact my passion is with numbers! I don't know when it started but somebody was pointing out that you're typing even numerals without seeing the keyboard while majority will do blind method only for alphabets in a typing institute. And, for over 30 years I have been somehow involved in number crunching business and I do believe that without Excel I could have come thus far! As my natural passion lies with numbers I was so obsessed with numbers and the obsession made me to dig deep in lotto games! With pure excel functions and forumula I have developed with a predicting system to foretell the likely numbers appearing for the next immediate draw based on the result history and other so many combinations which my system takes care of. In fact, one of my tweet for the last week's Power ball draw matched all the 5 numbers and my single tweet worth millions. Still I have thirsty to match all the 6 balls in the World's Mega Jackpot game of Power Ball. I am passionate about learning and sharing. I find that I learn more when I share it with others- there is always something to learn everyday...even if it is a lesson in patience when I handle my children. I am also passionate about mathematics (in any form) and understanding how things work...Sometime, i am also passionate about watching movies...whenever time permits nowadays. I'm addicted to learning something new, to make another voyage from incomprehension to a level where I'm confident in my skill. So far, I'm happy with my skills in Office, RC helicopter flying, child rearing, figure painting, networks administration, and a bunch of other 'hobbies' though I've given up on woodwinds - my lips are too ticklish! Passion is a fruit I do not get on with, but the emotion that is Passion; that is what gives my goosebumps and sweats and those little meaningful shivers, Passion is my opium. I live my life for my chosen family, for my friends and neighbours, helping those that need steerage in their lives and guiding those that get a little liost now and then. But what makes me happy is solving problems, and I choose to take Excel as my problem solving tool and develop solutions to daily problems my curiosity never fails to find whilst poking around in the scientific 'mundane and contentious'. So there you have it... I am passionate in finding my own answers to the problems of the world so I understand the truth and not the misinformation the world wants me to believe, and to that end I appear to have become Passionate about what Excel does to help my curiosity become sated. I am passionate about TEACHING! It was gives me a great joy sharing my knowledge about anything, with others. Gives a very satisfying feeling. So after getting trained for 12 years in Dance, I started teaching & Choreographing for Wedding Sangeets. I am also very passionate about numbers. Analyzing a lot of data in Excel and coming with reports gives me a high! My passion right now is Tableau 🙂 I had to use Excel at work today though, since it was a pretty simple report. I'm passionate about doing something new, design things, reading and writing to share what I've learned. I decided to stick your site to learn new things about Excel and to share this knowledge to others. Excel became part of my life since I start working and I wanna learn more things. this site is awesome, I am really fan about it as I'm passionate about the automation and dashboard developement, Since I am an analytics professional excel is very powerful tool for me. I am keen to learn new things in automation.